This months Style It! challenge is the Bebop Dress from beetlebones. You can view original article in Chinese here, but here is the translation. 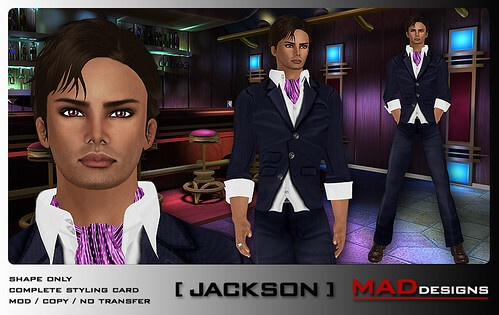 Maddox DuPont is co-owner with Kirk Claymore of Second Life brand MADesigns (part of KMADD Enterprise) which specializes in Avatar creation offering products such as shapes, hair, eyes and poses. Maddox works as a creative director/set designer for MAD Agency, modeling agency owned by KMADD Enterprise. Kirk & Maddox also host 100 top fashion brands for men on their sim ~ KMADD City. Elle: Where are you from originally and what do you do for a living? I live in Melbourne, Australia and have fine art background, majoring in multi-media. I work in Second Life full-time. Elle: How did you hear about Second Life and how long have you been creating for the game? 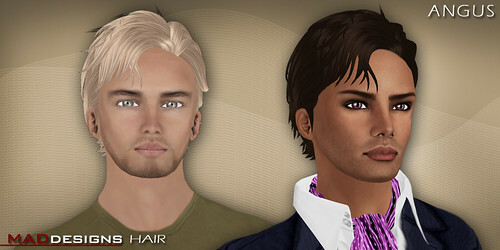 I have been in Second Life for 3 years in August and have been creating avatars for the past 2 and half years. I heard about Second Life via media, it was a television program about one of Second Life’s content creators who was selling furniture and lived solely from Second Life. I did not quite understand what I was watching, but I decided to try Second Life as the whole idea was fascinating and promised a lot of creative opportunities. 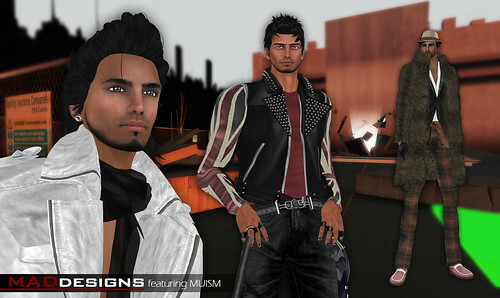 Elle: How did you first become interested in creating avatars of Second Life? Being in Second Life for the first 6 months reminded me of my childhood and school years. I was overwhelmed with how vast this world was, how much there was to see, do and learn and I had no idea where to start. So I started with myself and what I had passion for in my Real Life and that was photography. Working as a Second Life photographer I often came across clients that did not look good but wanted to have beautiful photos, so to achieve this I had to help them make lots of adjustments to their body (appearance) and what they were wearing (style). Eventually people were seeking my advice and help for their avatars look good instead of coming for photos so I decided to make business out of it. I created brand called MADesigns which initially specialized in creating avatars & looks (shapes) and over time with a help of my partner Kirk Claymore (Avatar name) and our creative team, MADesigns has become full blown virtual enterprise – KMADD Enterprise. 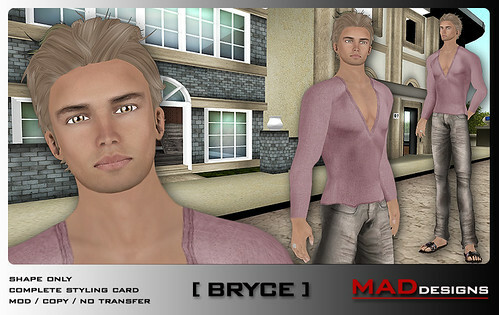 – KMADD City – which hosts over 100 top fashion brands for men in Second Life. Elle: What was it about Second Life that interested you so much? When I first found out about Second Life I just could not get my head around the concept so I was intrigued to find out what it was and experience it for myself. At first I thought it was a game (like Sims) but soon I discovered that in terms of creativity and networking it offered much more than any game could do. 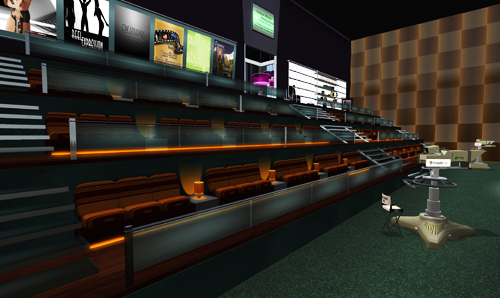 Because entire Second Life is created by its residents and you have freedom to move, interact and create unlike in most games, it offered great potential for creativity and entertainment. Today, I see Second Life as my virtual home and playground. I have friends here, it is where me and my partner spend time together since we live on 2 different continents and it is place where I work, create and can express myself without breaking my budget. Elle: Can you really earn a profit from selling virtual items in Second Life? It really depends. To be successful in Second Life is not much different from being successful in Real Life. You would need right skills, experience and patience to succeed in Second Life. People coming to Second Life with sole purpose to make money often do not succeed. Only your passion can sustain you while you are building your business and developing Second Life specific skills, during this time you often make no money. Also creative talent is not the only thing that is important and would make you successful in Second Life. Making profit in Second Life is about having a right product, good timing, effective marketing strategy and it can also depend on network and sometimes luck. Making a business successful in Second Life is a lot of hard work, but it is also loads of fun. Elle: How do you feel about the competition in your Second Life business from the other players and famous fashion brands? As a content creator for Second Life I welcome the competition. Without it I would not feel as innovative, focused and motivated. Elle:You have created many looks with your avatars do you follow particular style or criteria when you are creating? Kirk and I like to make characters that are real in their appearance; the style and presentation we use needs to tell the story of that character. When we style our products (Avatars/Shapes) we go for more classical looks that will withstand the test of time and that customers would understand and can put together easily. We basically take a trend and we interpret it in a way that would appeal to as many types of people as possible. The styles that we do on our fashion blog are more involved, have high detail and so they require more advanced level of skill to put together than the average customer has. I also personally create hair styles and here situation is different. Here I can really let go and create anything I like as it is product that provides unlimited possibilities, can be inspired by real life fashion or not and is very easy to use. Elle: Do you follow the runway trends when you designing? I think it is important to understand what is happening in fashion to be able to show style that is appealing and appears current. When you are designing you try to satisfy the most discerning customer first as this will automatically please the rest. Elle: What is the hardest part of creating virtual style? Because my business depends on other fashion designers having the right ingredients is probably most difficult part of creating a look in Second Life. 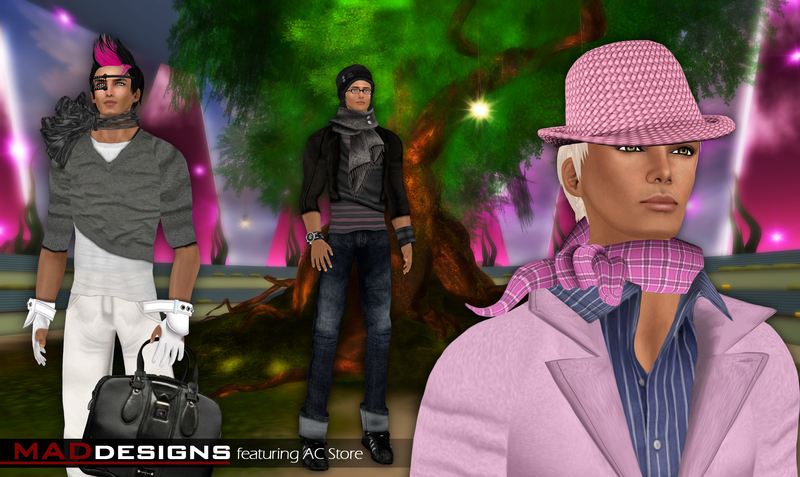 Not all Second Life designers create clothing that is flexible and that you can mix and match. Items have to come in a right color & texture, on the right clothing layer and option to modify them to be able to fit them properly to your avatar sometimes could be missing. Although this is sometimes hard it is also exciting as new looks can be created that often look complete and made by same designer when in fact they are combination from many. Elle: What do you think about the future of virtual fashion? I believe that Second Fashion is still at the stage of infancy. Many designers have created great basics for us to wear but only few have managed to create trend or make full use of the Second Life as a medium. Second Life designers often take inspiration from Real Life brands, I think the future of virtual fashion would be when Real Life brands start taking inspiration from Second Life designers. Elle: If you could change one thing about the Second Life world, what would you change? Content theft is one of the biggest issues in Second Life and one of the hardest to address. I believe that this issue can be dealt with more effectively by Linden Lab (owners of Second Life) than it is currently. Content theft robs original creators of their hard work and can discourage designers from investing in Second Life business. Elle: How to be an expert Second Life fashion designer and where should a beginning designer start? You cannot graduate and master something if you have not finished the elementary school. 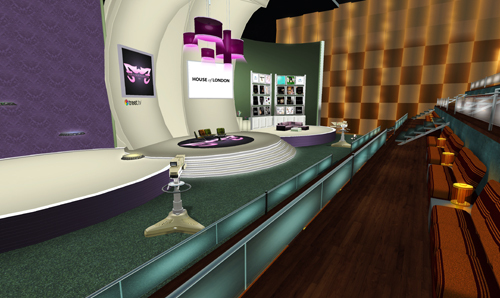 So I would start with learning Second Life – how it works, where to go, what is available and what you can do. There are volumes of information available on Second Life website as well as tutorials on YouTube and Google. Once you understand what you can do in Second Life and what is needed, ideas will come and the only thing would be left is to use your skills to make your ideas come true. Elle: Have you ever tried to design for any other fields of Second Life? Yes. I build all MAD Modeling Agency fashion sets on monthly basis and also create textures that can be used in building and photography. Elle: Do you have marketing strategy for your on-line business? Yes we definitely do. I have been blessed that my parent in Second Life is in marketing in Real Life so we are at advantage. Marketing in Second Life however works quite differently from Real Life. Marketing strategy of course would vary depending what type of business you have; while some things will work for one business they may not work for other. The best thing about Second Life marketing is that you can test what works and what does not with no great monetary consequences. Because marketing strategies are not created by big companies but individuals who might not have done anything like it before, most people in Second Life are more forgiving of poor marketing strategies and you can recover easily. One thing to remember is that if you do not have a quality product or you are offering a product that is widely available no amount of good marketing would help in selling that product. Elle: Which do you enjoy more, playing or designing? I am self confessed workaholic so designing is mostly what I do. But when your work is designing it feels more like playing so it does not seem so bad. Elle: Who is your costumer? Do you know about their real life? How do you know if your work is popular or not? Because of what we do our business attracts customers that are new as well as experienced players, we also cater to all age groups and both male and female. People usually tell you when your work is good. What is great about Second Life is having access to designers and being able to talk to them; make requests and give them feedback. My business is successful only because I care for my customers and what they think. Elle: Do you ever think of being a real life stylist? If yes, what is your next step. If no, why? I did consider it in the past, especially when I first started styling. You get excited and carried away when you discover new talents that you never thought you had before. Second Life is like that – it can awake a lot of hidden potential and allows you to make your dreams reality. I do not have a need to be Real Life stylist. I am quite content to do what I love doing and possibly earn just as much as Real Life stylist and all from the comfort of my own home. Two of my favorite colors: black and white! 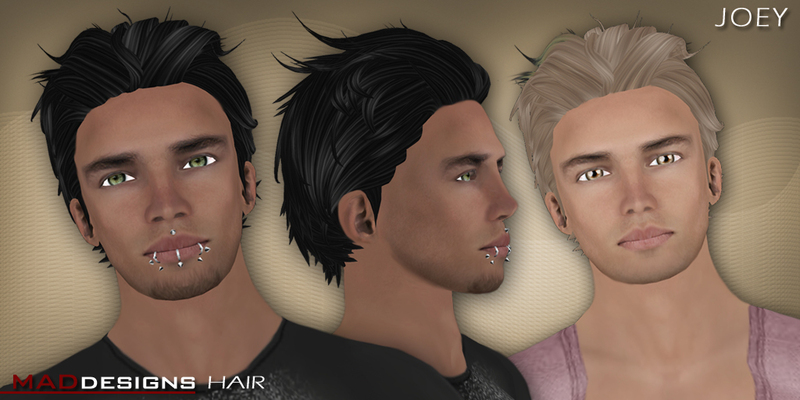 ANGUS & JOEY hairstyles are first 2 styles in new series of styles from MADesings – Series Release #5. This is low prim sculpted hair with high detail backs and natural form and flow. Plenty of flexi for movement as well. You can see our complete HAIR Collection currently on offer here. 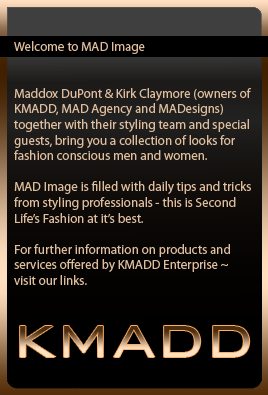 We are pretty much releasing hair every week so if you would like to stay updated please join KMADD Enterprise Group. Exclusive previews and giveaways are only available to KMADD Members. Fabulous Fashion is a program on Treet.tv hosted by Angie Mornington. I had a privilege in redesigning the studio 2 months ago to give it more modern and cosy feel. 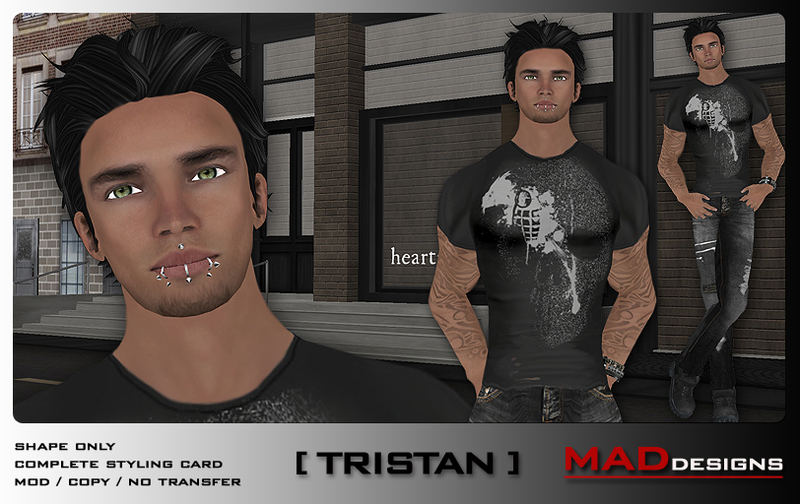 Visit the new studio and grab a free gift from MADesigns (free hair & eyes). This collection of shapes was made for latest hair release from MADesigns – featuring new Damiani & The Abyss skins. Slim built, perfect body proportions for discerning shape collectors. TRISTAN is located in Bad Boy Collection on Level 4, while JACKSON, THEO and BRYCE are in Young & Slender Collection Level 3 or check our store lobby for new releases. Shape demos are available from red info panels in corresponding collections. We would just like to remind you that all MADesigns shapes come with free personalized adjustment; if the body is not to your liking by simply contacting us we can make changes to suit your needs. If you feel confident however making changes yourself know that all MADesigns shapes are MODIFY and have correct proportions already that all you need to do is change body thickness, shape height and muscle tone to achieve desired look. If you are a skin/fashion designer and would like us to make special collection of shapes featuring your original creations – please contact Maddox DuPont or Thalia Jie. 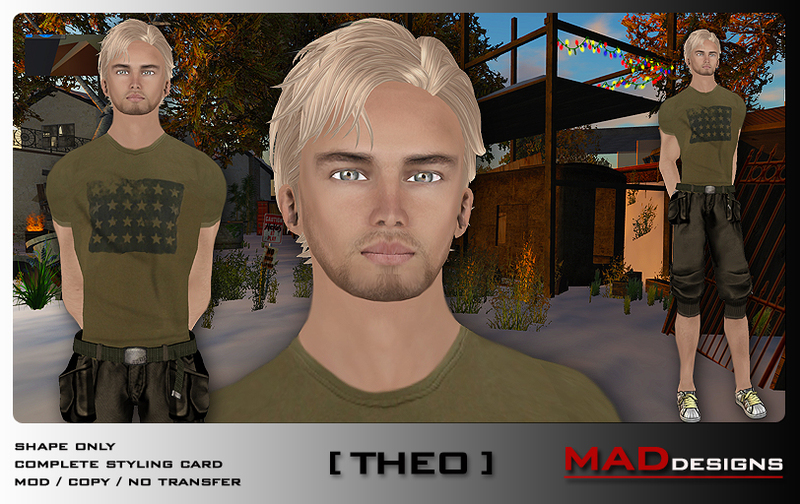 Thalia and Maddox have over 3 years experience in fashion and avatar creation. We are pretty much releasing new shapes every week so if you would like to stay updated please join KMADD Enterprise Group.